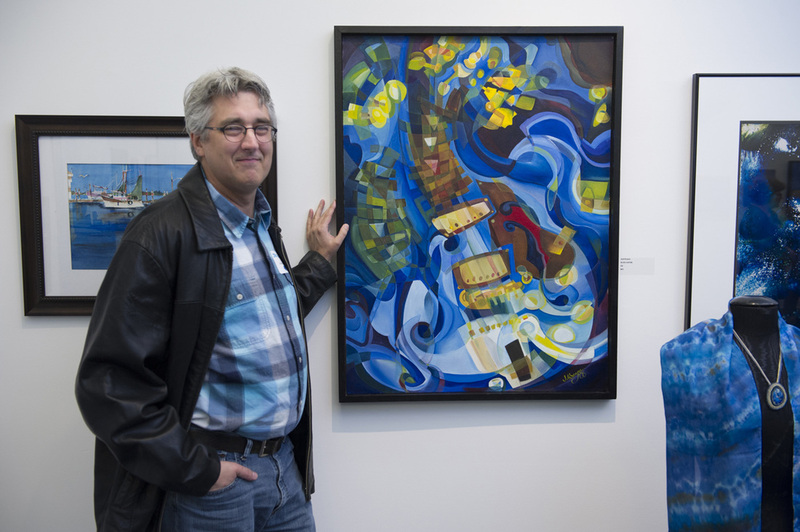 Valley Arts Center in Chagrin Falls was the setting for a two month long exhibit titled “Moody Blues”, an exhibit showcasing the many variations of blue in art. All media was accepted through a jury process. I submitted multiple entries of my shibori silk scarves, with “the storm” being the one they selected for entry. And a fellow fiber artist, Katherine Graham Sarlson also juried in with a beautiful cut devore silk scarf in blues and greens… simply elegant. Well, today the show ends. It was lovely to be a part of such a wonderful group of talented folks… and to be accepted in the art community for my contributions. The Storm is a very traditional shibori pattern, and is meant to resemble the angry waves of the ocean through variation of color of blue, and diagonal patterning. It is a favorite of mine to make, and I have never been able to duplicate the exact pattern twice. Thank you Valley Arts Center for this opportunity. How nice it was.